While Mike is recovering from his operation, I wanted a project I could work on...and spend time sitting with him. Hand quilting seemed to fit the bill. I bought a couple of lovely, traditional Sandie Lush cushion cover quilting patterns months ago. They were put into the pile of 'I'd love to have a go at hand quilting. I'll get around to trying this one day'. I always worry about ruining lovely fabric, but wanted to use oyster silk Dupion. 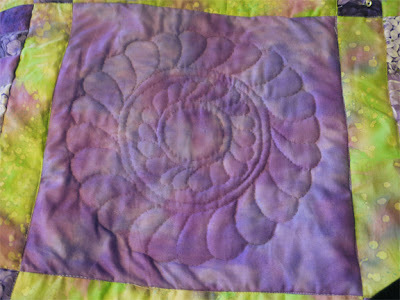 I transferred the pattern to the silk using my 'light box'. This sounds very grand, but is Mike's car inspection lamp placed under my quilting extension table. It is much easier than tracing against the window! The wadding is a very light wool and the backing is a fine calico. Now I need to make it up into a cushion. Finishing Projects Feels SO Good! It feels SO good when I finish a project! ...And I've managed to finish two. My Sampler bed quilt is finished and is now sitting on my bed - just in time for the freezing temperatures we are expecting this weekend. Unfortunately, it is too big to photograph properly. The second photo below shows my partner, Mike holding the quilt up. He really is behind the quilt. No, he isn't a little person - he is 5 feet 7 inches tall - the quilt really is that big! I was laughing so much, I must have jogged the camera, so that photo is blurred. I also finished my New York Beauty wallhanging. This was meant to be a cushion cover, but I had so much fun sewing the blocks, it finished up as a wallhanging. Lastly, I created a second little fused quilt to go with the first one I made. I have just finished an online Craftsy course taught by Laura Wasilowski called Hand-Stitched Collage Quilts. I learned such a lot and really enjoyed making my first little art quilt. I hand dyed the background fabric to give the piece some extra interest. I added some of my favourite flowers. Fusing is quick and fun. Additional hand stitching gives the design more definition. SOOOOOOOOOOOO much fun! 2012 was a year with great ups and downs. I retired from teaching at the end of 2011. I said goodbye to my dear father at the end of January. I miss him every day. In May, my 14 year old westie, Oscar also left us for a better place. In June, my elder son James married Natalie. It was a wonderful day and a blessing to see them so happy. The rest of 2012 was relatively quiet. I had a great time exhibiting at Hugglets in February and September. I launched a new teddy design in September that I love. I also really enjoyed the Teddies Tea Party, Friends of Teddy and Christmas Treasures online shows I participated in. I completed a Patchwork course for beginners in September. I loved every minute of it and discovered that quilters are lovely, kind people. I am hoping that the process of writing down my goals for 2013 will help me to stay focussed in 2013. I have some unfinished projects I need to finish and lots of new challenges ahead. 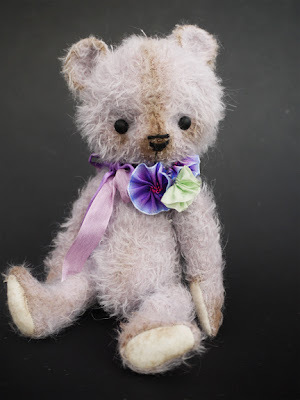 1.Develop my oldie teddy bear design further. 2.Develop my realistic bear design further. 3. To Finish in January -Finish my bed quilt. I learned how to sew 12 different blocks in the beginners patchwork course I completed last month. I actually had 18, 12 inch blocks as I made some in two different colourways. I used mostly Fabric Freedom's Pure Velvet fabrics plus some Fossil Fern for the lime green sashing. The fabrics are gorgeous, but when cut up small for patchwork, I felt that some of their beauty was lost. I wanted a large 90 inch by 90 inch bed quilt for our bed, so decided to add another 18 blocks showcasing some of the fabrics. Over Christmas, I sewed the blocks and sashing together and basted the batting and backing to the quilt top. I also attempted hand quilting for the first time - applying it to three plain blocks. 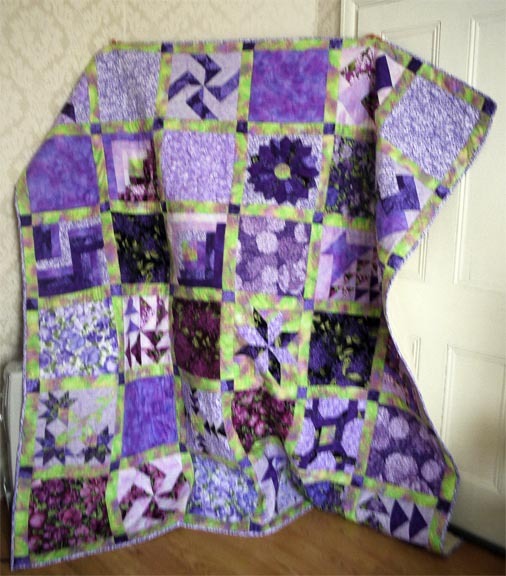 I am in the process of adding further quilting to the top and then will need to add the binding. 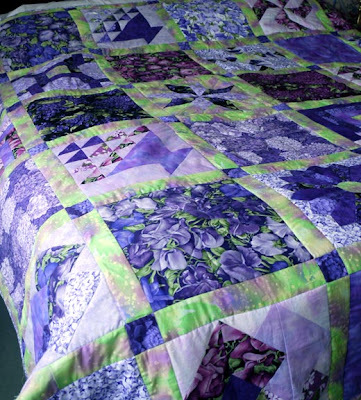 The quilt is too big to photograph indoors and the ground is too wet outside to photograph it out there. My very first effort at hand quilting. I really enjoyed it, but there is A LOT of room for improvement. 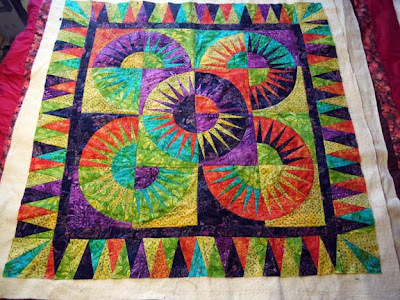 I have free motion quilted on some of the unpieced patterned blocks, but some will need unpicking and redoing, as they are not up to scratch! 3. January - May: Learn to free-motion quilt. 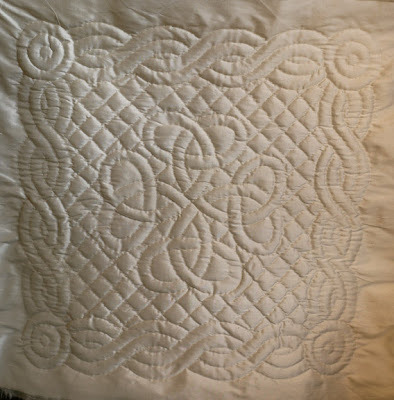 I have seen some amazing quilts that have been quilted using free-motion quilting I have dipped my toe in the water but am pretty awful. 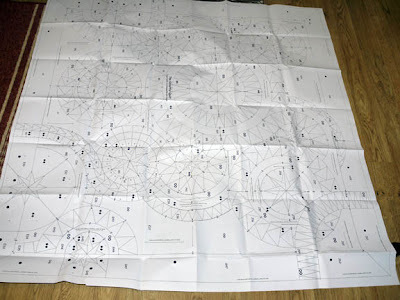 I am starting a course in FMQ in two weeks, so am hoping to improve. I realise it takes a lot of practice to become proficient, so I will definitely need to put lots of hours in! 4. February - Finish my New York Beauty wallhanging. 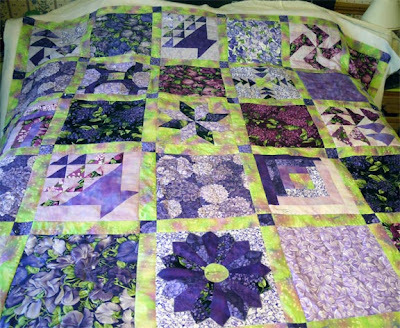 This needs more quilting and then binding, but will need to wait until my bed quilt is finished. I discovered the joy of paper piecing recently. I adore it! I originally intended to make a couple of cushion covers but was having so much fun I kept going. The fabrics are some batiks that I picked up at a local quilting show. The stand had a special offer going and I just picked the fabrics randomly - without a project in mind. I am very lucky that the lighter and darker values seem to work together in this scrappy design. 5. January - March: Complete six teddies for online show in March. 6. 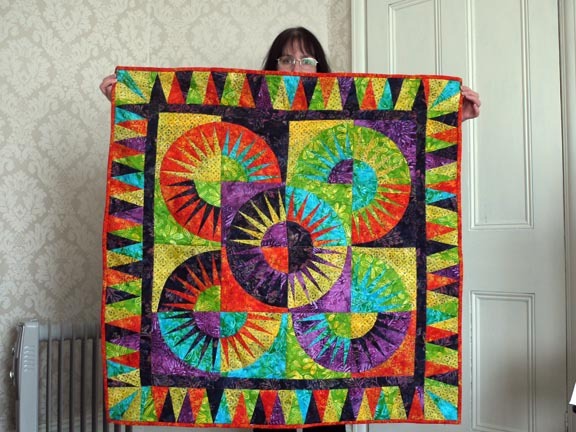 January - May: Complete the Be Colourful quilt. I may have mentioned that I adore paper piecing. 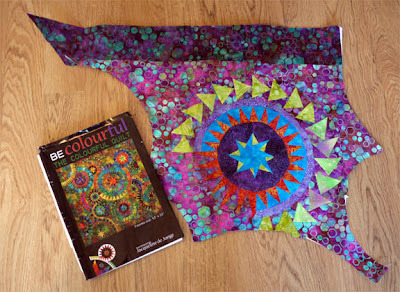 In early December I started to make the Be Colourful quilt using a pattern by Jacqueline de Jonge. I just love colour and the complete freedom of the design. I have not been able to source many of the original fabrics, but will try to remain reasonably faithful to the original colours. This is on hold until I finish my bed quilt and wall hanging. 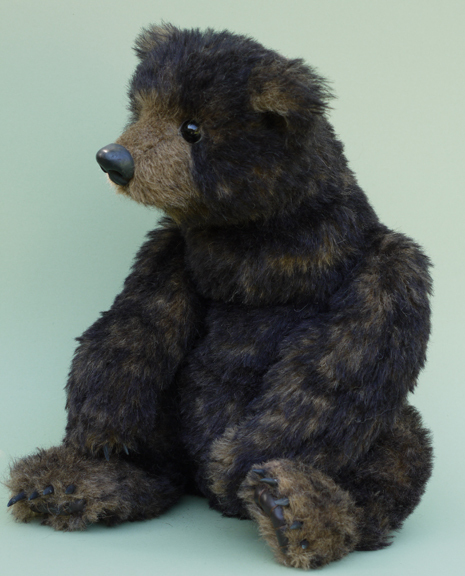 It may have to wait until I have created th eteddies for my March show. I am still a beginner in patchwork, so this is a big challenge for me. It has been great fun so far. 7. 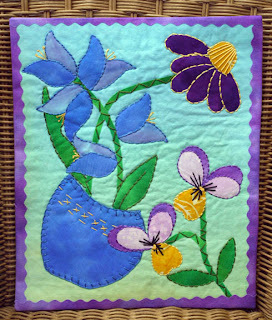 June: Learn to applique. 8. 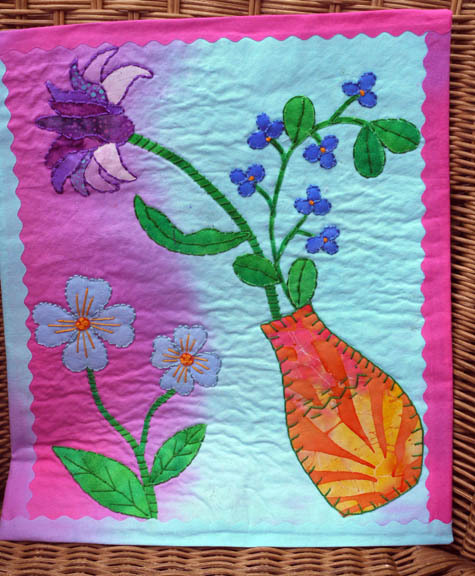 July:Design and make a small art quilt. 9. June - July onward: Improve hand quilting. Complete hand quilted cushion cover. 10. July - August: Create teddies for September Hugglets. 11. 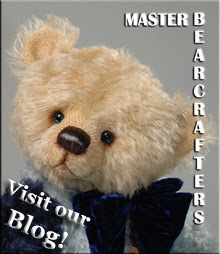 September - October: Create teddies for Christmas online show. 12.November - December: Slippage time - Finish any unfinished projects.